Everyone who has an email account, accounts on social networking sites, bank accounts, who is an active member of the forums and keeps a cloud storage worry about the security of these accounts as they do not want their personal data to be accessed or hacked by anyone. So, what is the solution? Log in every time you visit a particular account? Well, this may require you to have an excellent memory, because in this case you will be required to remember passwords. However, assigning same password to all the accounts can counter his memory problem, but it can rise sever problems to the security. It is actually the worst you can do to manage passwords. Therefore, if you are an Androiduser then a safe and sound solution to manage passwords is getting the best Password Manager for Android. Below are Top 5 Password Managers for Android to help you choose the superior ones. It securely stores the passwords, bank account number, credit card information, e-shopping essentials, web contents and custom data. It has come up with a built-in editor that itself initiate categories to strengthen the security their custom tools. It has the ability to search by the fields, you will not find any false advertisement in this app as it is accredited for its best functioning. Moreover, you will get an export of unencrypted data to the SD card or a USB device. It’s best for android and other operating systems as well. One of the most popular password managers is KeePassDriod that enjoys the favoritism by most of the Android users. 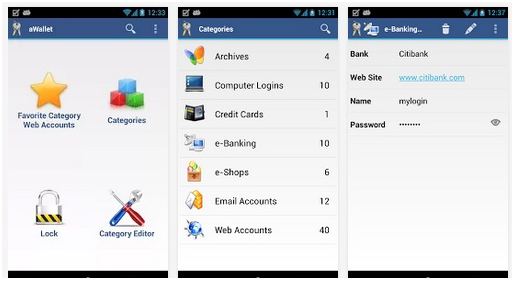 It is the best open source app available to manage passwords and assure security of the accounts. It assures that all the passwords of consumer’s accounts arehidden behind asterisks while enabling the users to see them temporarily. Users often copy the passwords to save energy by not typing it again and this app has provided a secured ease to such users as it clears the clipboards when the password or a user name is copied. Therefore, if you are looking for a simple but effective password manager app, then it’s free of cost app will serve you the best. SplashID is often called a Safe that manages the security of all your accounts and account information as a sensitive data vault. It has an extensive storage to record types and categories while caring for the backups as well for the important passwords, registration codes and even insurance prescriptions. You just need to realize the need for a password manager app and you will be served withSplash ID that fulfills the purpose in the best way. Another very popular and favored password manager is LastPass that is known best for its simplicity. 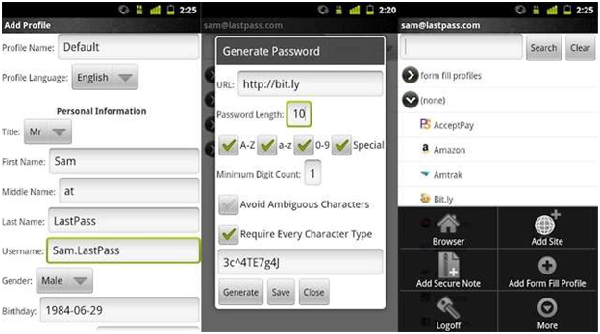 It’s easy, quick and syncs all the passwords of accounts securely across all the browsers on Android devices and others. It’s built in browserenables the filling of login information automatically for all the sensitive websites. It is managed with a monthly subscription. 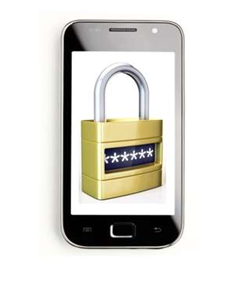 Secure has the most Android users worldwide for its provides the time-tested services through trustable and convenient solution to securing and storing the passwords and syncing them with accounts at the time of need. 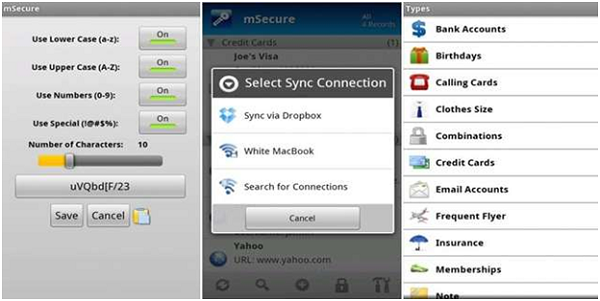 It uses 256bit blowfish encryption that makes your android device ultra-securefor all your friendsand family members that love to interfere in your personal life through accessing your accounts. It supports private wireless networks and also Dropbox cloud to help synchronizing data over an internet connection.